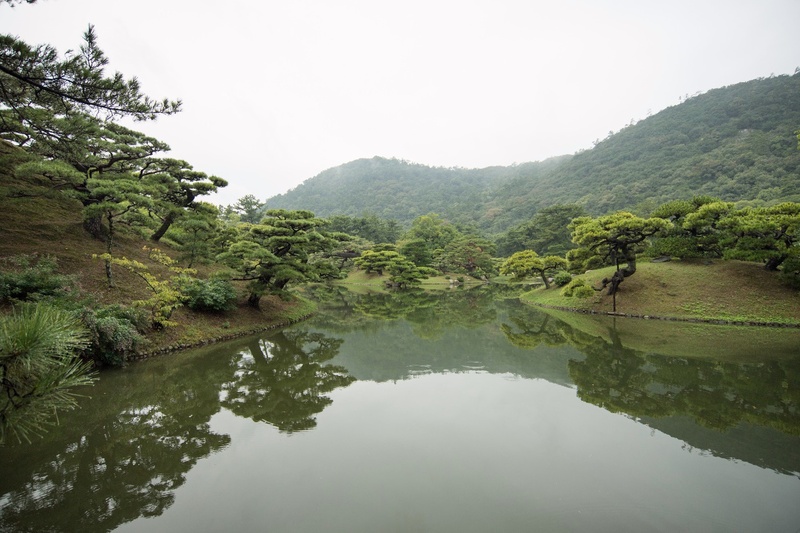 Opening and closing times at Ritsurin Garden are timed to match the times of sunrise and sunset. 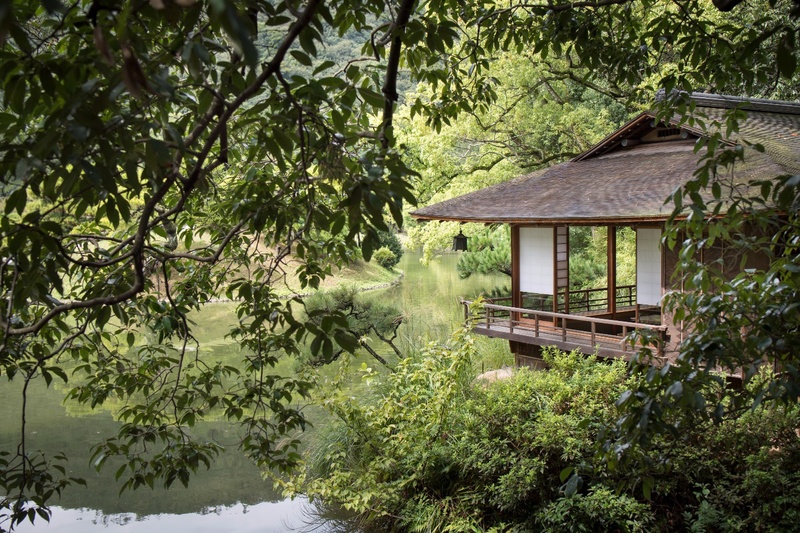 During the day, the garden is busy and bustling with crowds of tourists, but it is also gaining popularity as a place for enjoying a quiet and peaceful morning. Today we have woken up early, and are heading to Hanazonotei, a souvenir shop and restaurant that would originally be final destination at the the end of the recommended South Garden course. We’ve heard that if we get there early enough, we can enjoy a special morning okayu (congee rice porridge). We need to fill ourselves up before taking a walk around the vast garden, we say, making excuses that favor the practical over the aesthetic (or “dumplings before flowers” as we say in Japan), as we go through the garden gates and head directly towards the restaurant. After informing the staff that we have a reservation, we are invited to enter the building opposite. The small building facing out onto Hokko (the North Pond) is a tearoom named Hanka-tei, which is an annex of Hanazono-tei. Our eyes are drawn to both the tasteful interior and the view of the garden scenery. From the open window, you can see the whole of Hokko with Mt. Shiun in the background. “This is the only place in the park where outside buildings cannot be seen. 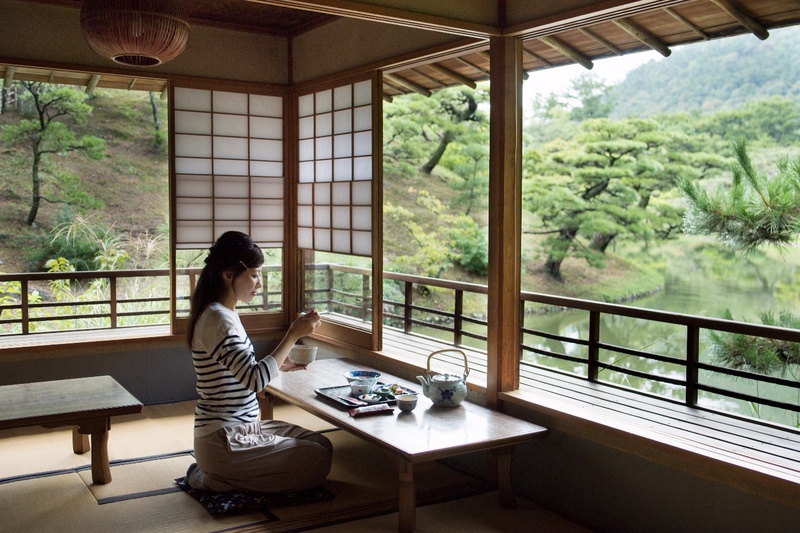 Please stay as long as you like and enjoy the view,” says Mrs. Otani the proprietress. It feels as though the large window frame is a giant picture frame, with a view like a beautiful Japanese painting spreading out before us and filling our field of vision. This scenery, too, is reserved exclusively for people who make reservations to have morning okayu. Almost straight away, our breakfast sets are carried over to us. The set includes an assortment of stewed vegetables, grilled fish, and a small bowl of seasonal pickles. The menu incorporates all of five tastes and five colors of Japanese cooking, with all of the items prepared carefully and delicately to look delicious and richly colorful. The exact content of the set changes with the seasons, but the Shoyumame (beans seasoned with soy sauce) and Wasanbon—both famous specialties of Kagawa prefecture—are staples that are served throughout the year. The ume (Japanese apricots) used in the pickles are picked from trees in the garden. And then comes the okayu, piping hot with steam that wavers in the air as it is carried over. As you transfer the smooth, shiny okayu into your mouth, a gentle flavor spreads throughout. As you eat it in the fresh morning air, it slowly warms you to the heart. We asked Mrs. Otani her recommended season to visit. “The early mornings from Autumn into Spring are really beautiful. As the sun starts to rise and begins to shine on Mt. Shiun in the background, the colors slowly change from yellow to red,” she explains. Who would have thought that you could see such a dramatic scene from here?! We slightly regretted having come quite late that day, after the sun had already risen. Next time, we will have to come right at opening time. 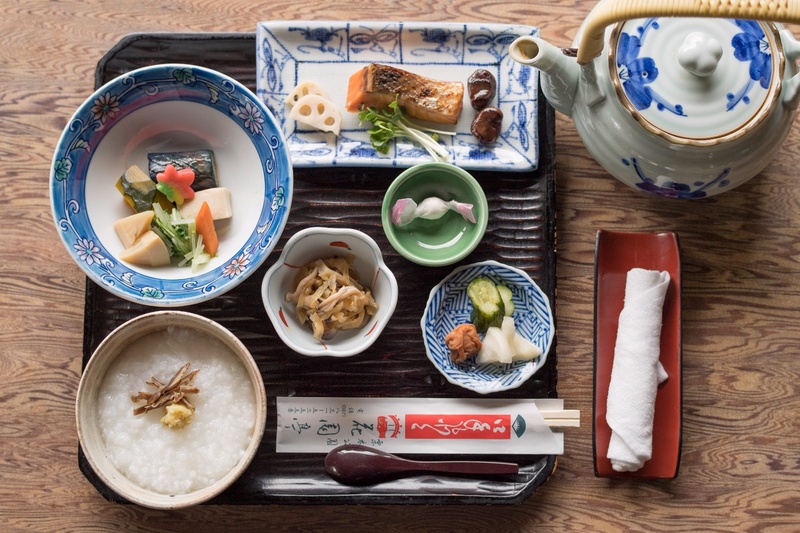 Visitors can enjoy eating morning okayu only between the hours of 07:00 and 10:00. 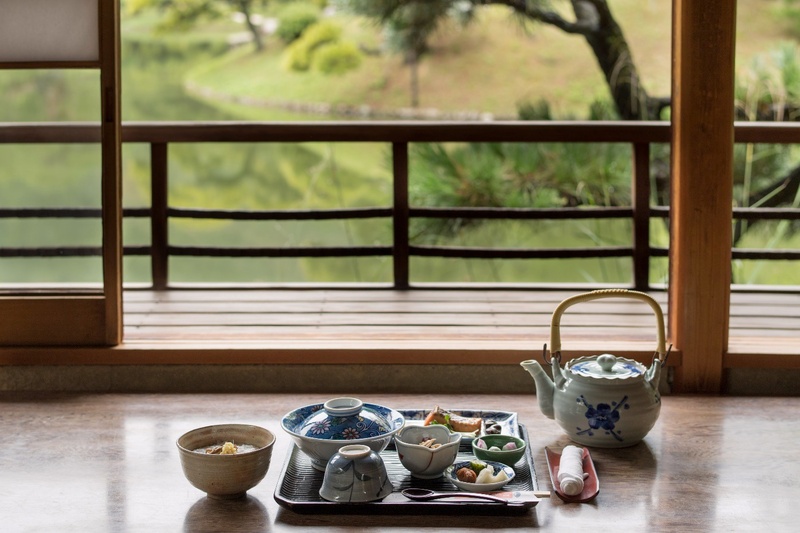 I have a feeling that enjoying a luxurious morning in the teahouse will make that day of your trip to Takamatsu all the more wonderful.